Increase your team's tempo and score more points using this dynamic ball screen offense! The D'Antoni-coached teams of Phoenix and most recently, Houston, have utilized a successful ball screen motion offense that took them all the way to the Western Conference Finals. 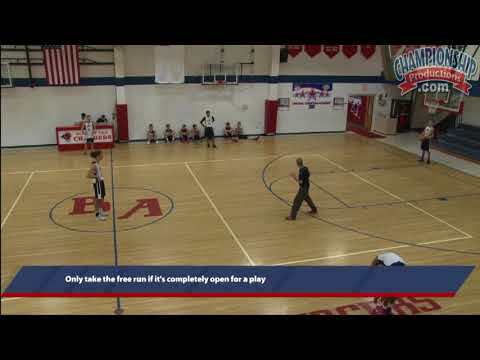 5x ICBA State Champion (Indiana) head coach Jeremy Bialek models his own ball screen motion offense off of this potent offense to give his players numerous scoring opportunities, and, he details the entire system in this informative, instructional video. By installing the ball screen motion offense, your players will learn to read how the defense plays a screen and react accordingly. Most importantly, this is a fun, up-tempo style of offense that can be used in the half-court and out of transition. No matter what, with this offense, your players will have great angles of attack that will present various scoring opportunities in the half court and in transition. Coach Bialek centers his offense around constantly having two ball handlers. The ball handlers' focus is to get downhill, especially in transition. Pushing the pace and stretching the floor with your wings will allow the ball handlers to draw out help side defenders as they turn the corner and look to attack the rim or hit a post rolling to the rim. As teams pick up on your transition ball screens, they will look to defend the screens several ways. With a hard hedge/trap, ball handlers can time the screen just right and look for a slipping post player or back the ball out in order to draw the defenders out and create space. This will allow your players to re-attack and split the defenders going downhill. On a regular hedge, ball handlers can use a hesitation move to create separation and a timing delay, allowing them to turn the corner or reverse the ball, looking for the post player on the roll. In a switching situation, guards can look to attack the switch with a bounce off and re-attack, especially if the mismatch is a slow-moving post player. Your ball handlers can also take advantage of a post player diving hard to the basket and sealing a guard. Bialek gets his offense rolling with several easy-to-use entries that create movement and provide opportunity to get the ball into your best player's hands. Using dribble hand-off options, you can create downhill action, attacking the middle of the floor out of a corner hand-off and a ball screen within the lane. Using double down screens, Bialek shows how you can create action for your best shooter to come off of down screens and a ball screen for an open 3-pointer or a driving lane to attack the basket. Beginning with 5-on-0 transition, your players will learn the lanes and spots they need to fill to spread a defense out and create space for ball screens and driving lanes. As athletes learn the rhythm and driving lanes, you can add a defense into the mix and allow your offense to see reads and their options to attack coming off of the ball screen, down screen, or dribble hand-off option. Breaking down ball handlers' attacks, Bialek uses 1-on-0 and 1-on-1 screening drills where players are attacking downhill in transition and work on their finishing moves around the rim. Building into 2-on-0 and 2-on-2 drills, players learn how to hit the post player rolling or popping with various passes such as a pocket pass, bounce pass, lob pass, and dump pass. Each drill will help your players learn the timing, accuracy and rhythm of the screening action.